Thanks so much to all of you who attended the wetland forum last Wednesday and/or assisted with the preparation for that event. It was another great success, with over 50 people in attendance (some pictures below). At this event, we again made several contacts with landowners interested in protecting their land and with folks in professions who can utilize the model data in their work. I was thrilled to connect with a realtor who is interested in the model data to flag potential conservation properties (and encourage landowner participation/listing in our conservation buyer program) as she goes about her work! I believe our NRCS folks also generated interest in WRP from several folks in attendance. A special thank you to Love Creek Nature Center for hosting us- what a great site for the event! And also to Matt Meersman, Frank Velazquez and Alex Bozymowski, our speakers for the evening. We had really good questions and a pretty good appetizer spread for those of us who forgot to eat dinner. These outreach events will go such a long way in helping us connect with priority landowners so that we can protect more critical land and water resources in the St. Joseph River Watershed! Today marked the 10th quarterly meeting for the Wetland Partnership project. Click here for a summary of the meeting. 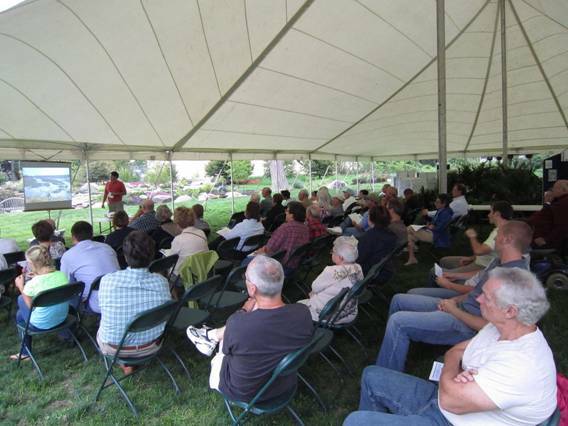 A meeting was held in the Prairie River Watershed with about 25 people in attendance. Rachel Smith compiled a mailing list using data from the wetland assessment. Matt had a computer set up so that landowners could actually see maps of their properties and the wetlands on each parcel. Some discussion was held concerning the Watershed Management Plan that will be developed by LaGrange County SWCD for the Fawn River and how the wetland assessments can be used to enhance the final plan. 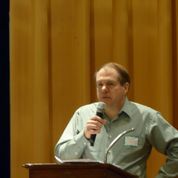 Joe Schmees encouraged the SWCD to make sure that critical wetland areas for preservation be listed in the plan. Matt reported that the 9th quarterly report has been submitted to EPA. If the current timeline is followed, there are just two more quarters remaining in the grant, which would end in September. There is still money left in the grant possibly to do some additional outreach events. Matt talked with EPA and they sounded optimistic that an extension could be given on the grant. Matt sent an official request for a one year extension, which would allow for more time to use the remaining funds. There was some additional discussion about the Prairie River Watershed wetland event. Rachel Smith sent out a post card, not a formal letter, as invitations to the meeting. Rachel did a couple of interviews promoting the meeting and the wetland project and there were some publicity articles in local newspapers. Four landowners, each owning at least 40 acres of land, were interested in knowing more about ways they can protect the wetlands on their properties. It was a successful event. Geoff Cripe is working to hold three more outreach meetings this summer and fall. He is working with a committee in Cass and St. Joseph Counties. One meeting will be scheduled in the Dowagiac River Watershed/Berrien and Cass Counties. 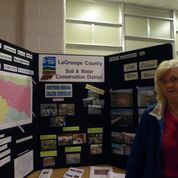 Marcy Colclough did a presentation at the Calhoun County Conservation District’s Annual Meeting. Marcy has two meetings scheduled next week with local planning officials to begin discussing ways to use this wetland information in new planning ordinances, etc. One meeting will be held in Paw Paw, Michigan on Tuesday, April 30 and the other is scheduled for Thursday, May 2 in South Bend. The purpose of the meetings is to introduce the planning experts to the wetland project and discuss the strategy to use throughout the watershed. Some of the questions include where to hold future meetings; land use throughout the watershed; what options are available for protection and what are gaps that local units can fill with state regulations. Having the data on line so that individuals and municipalities can access the information is crucial to the success of this project. The tables are available on line now without any explanation, but it will leave most people scratching their heads. Our next meeting will be held on Thursday, August 22 2013 at 10:15 a.m. in the Three Rivers Public Library. Today marked the 9th quarterly meeting for the Wetland Partnership project. Click here for a summary of the meeting. 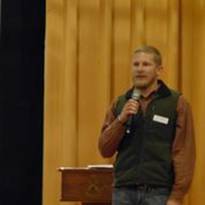 Matt announced that the Friends held another successful outreach event on November 7 at the Howe School in Howe, Indiana. This was the third official outreach event of the Wetland Partnership Grant, counting one in Branch County, Michigan, and one along Christiana Creek in Elkhart, Indiana. Matt explained that the wetland prioritization tool was used to develop a list of landowners that owned the most highly functioning wetlands for either protection or restoration in the local Fawn and Pigeon River watersheds. There was an approximate return of 7 to 10 percent of landowners that received letters in attendance at the event, with a total near 45 attendees including Friends and other Partnership members. 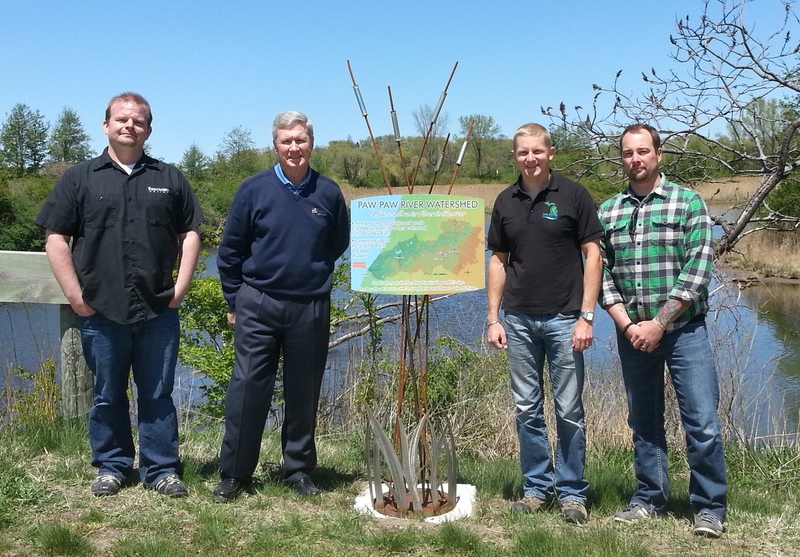 Matt spoke at the event about the Partnership project and the important functions of wetlands. The local SWCDs gave a presentation on projects being completed in the area as well. Wood-Land-Lakes RC & D and U.S. Fish and Wildlife Service were on hand to talk to landowners about potential wetland restoration/protection projects. Scott Fetters mentioned that he is already working with 3 landowners from that night on wetland projects. He has two landowners in LaGrange County and one in Steuben County, with the largest project near 100 acres. Matt and Marcy had a recent meeting with Jeremy and Chad from Michigan DEQ to discuss the wetland prioritization tool and the final deliverable product. They were able to give them the final, merged parcel data. Matt and Marcy expressed that they felt it was a productive meeting, and that Michigan DEQ is excited about the prioritization methodology developed through the Wetland Partnership Project. Matt announced an upcoming event that is not associated with the Wetland Partnership Grant, but is similar in scope. 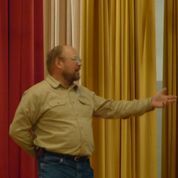 He explained that through the Van Buren County CD 319 grant they are hosting two events on January 31, to discuss wetland functions in the Black and Paw Paw River watersheds. They will be held at Sarett Nature Center in Benton Harbor from 3 – 5 PM, and at Lake Michigan College in South Haven from 7-9 p.m. Matt explained that the meeting locations were designed to be at the downstream end of the respective watersheds. Matt stated that the group needed to begin thinking about the next outreach event for the Wetland Partnership Grant. There have been two events on the Indiana side and one on the Michigan side. 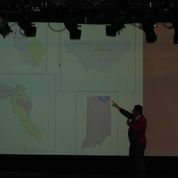 He discussed that the group would like to target the next Indiana event on the Elkhart River watershed, but there are currently no clear choices for another event in Michigan. Matt also discussed that there are areas in Cass and Van Buren Counties that have had large amounts of wetland loss, and this area might be good for targeted outreach. 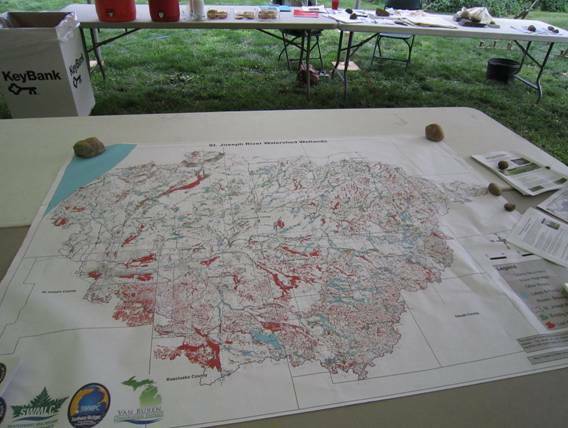 It was reiterated that the final data from the wetland prioritization model should be taken into account when deciding the next Michigan outreach locations. Matt and Marcy gave a presentation to the St. Joe Harbor Authority concerning the wetland prioritization tool. Matt explained that it was a perfect group to target. It was explained that they are concerned with sediment deposition in the harbor, and the tool could potentially indicate wetlands that would be useful for sediment retention in their watershed. Matt and Marcy are also giving a presentation to health departments in the Michiana area tomorrow to discuss pathogen retention potential in local wetlands. 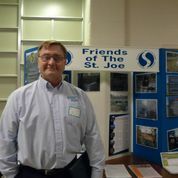 Matt also gave a presentation to the St. Joe River Home Owners Association. Matt thanked Rachel, Melanie, and Brian for their work in merging the duplicate parcels in ArcGIS for use with the wetland prioritization tool. This work is now complete and was delivered to Michigan DEQ this past week. Matt talked with Michigan DEQ about the final deliverable and what it will be. Other GIS tools have been placed on a read-only CD and work as a standalone program, but Matt explained that the hopes for this project it would be an online tool. Our next meeting will be held on Thursday, April 25, 2013 at 10:15 a.m. in the Three Rivers Public Library. 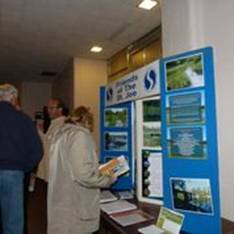 The Friends of the St. Joseph River hosted another successful wetland partnership outreach event in Howe, Indiana with about 35 in attendance for a very polished program. A dozen of the attendees came in response to our targeted invite (representing about seven percent of all letter recipients). Most of the attendees came early and stayed after the program to grab handouts, take a run or two at the impressive cheese tray and discuss their interests. Several left with interest in conservation program enrollment. The event was successful due to the collaboration of all our conservation partners that made this happen and many of whom attended in support. A huge thanks to our speakers, Martin Franke, Dave Arrington, Matt Meersman, RD Wolheter (landowner) and Jerry Gray (landowner), who kept it very interesting and informative for our attendees. A special thank you to Martin Franke and Kayleen Hart, representing the Lagrange and Steuben Soil and Water Conservation Districts, respectively, Brian Musser who works for NRCS in their Lagrange office who collectively helped to plan and put the program for the evening together. Thanks to Matt Meersman, who booked the venue, spoke and worked behind the scenes in the sound booth to keep everything running. We thank the Howe School who allowed us to use their Bouton Auditorium, a great venue. Additional special recognition to Marcy Colclough who drove all the way to Howe from Benton Harbor (MI) to help set up for the event and take pictures. Today marked the 8th quarterly meeting for the Wetland Partnership project. Click here for a summary of the meeting. Matt Meersman and Marcy Colclough met with Julie Pioch to bring her up-to-date on the project. She will be working under the grant to develop a plan to aid with outreach to government officials about the ways they can use the information being developed through this wetland partnership grant. Julie is in charge of the citizen planner program with MSU Extension. Matt is working with her to develop an agreement/contract between MSUE and FotSJR. Julie stated that after a contract is completed and signed, she will begin developing a strategy to work with units of local government to show how the wetland information can be used in planning. This should take about two months. They will be including an add-on course focusing on wetlands to the MSU 7-week Citizen Planner Course. Julie is gathering information on what to include in the course. Once the lesson is developed the information can be taken to local officials. It will be a challenge to get Indiana planners involved since there is such a huge difference in local government structures from Michigan. The parcel data is over 50 percent complete for the entire watershed. Matt, Eric, Brian, Melanie and Rachel are merging the parcel data by county. The "Wet and Wild at the Well Field" was a great event held last week in the Christiana Creek Watershed. One hundred letters were sent out to key individuals owning wetlands classified as being good for water quality. Five of the people who received letters attended the event, with three of them being some of the top 10 landowners in their respective watersheds. At least one of them requested that someone follow-up and provide more information about the wetlands on their property. 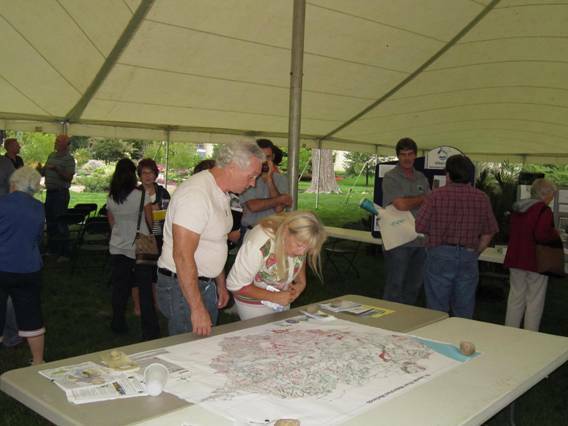 Another upcoming event will focus on the Elkhart River watershed with a focus on restoration. Eighty percent of the wetlands in this watershed have been lost. An attempt will be made to find landowners who have enrolled land in WRP through NRCS to provide a testimonial at this event. Geoff will provide information about the tax incentives available through the Land Conservancy. Regarding Outreach strategies, efforts can be piggy-backed with other events, but there will be several more events specifically targeting the wetland project. Geoff and Matt will be doing 15 minute presentations at some of these other events. One of the next events will be in the Steuben/LaGrange area of the Pigeon River/Fawn River Watersheds. Southwest Michigan Land Conservancy has agreed to help with 6 events with 3 in Indiana and 3 in Michigan – 2 focusing on protection and 1 with restoration. The other event in Indiana will most likely be the Elkhart River Watershed. Our next meeting will be held on Thursday, December 20 at 10:15 a.m. in the Three Rivers Public Library. FotSJR Wetland Partnership Project Goes "Wet N' Wild at the Wellfield"
The wetland partners held their second outreach event, “Wet N’ Wild at the Wellfield”, today at the Wellfield Botanic Gardens in Elkhart, Indiana. The event was a great success! 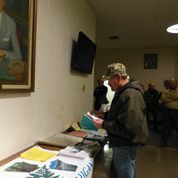 There were around 50 people in attendance and the partnership made some great connections with landowners and interested residents living in the Christiana Creek sub-watershed. The Southwest Michigan Land Conservancy, FotSJR and Christiana Creek Coalition sponsored the event with support and attendance from Southwest Michigan Planning Commission, Natural Resource Conservation Service in Indiana and Michigan, St. Joseph County Indiana Parks, St. Joseph River Basin Commission, the Elkhart Soil and Water District, City of Elkhart and several others. The project partners are now discussing how they can build off the event and ensure that the model data gets into the hands of conservation organizations, city planners, public officials, drain commissioners, etc., to help implement wetland conservation activities throughout the Christiana Creek sub-watershed and surrounding areas. There will be four (4) more outreach events planned over the next year. Today marked the 7th quarterly meeting for the Wetland Partnership project. Click here for a summary of the meeting. Matt Meersman reported that he has conducted training for the merging of parcel data. Melanie Stoughton has completed St. Joseph County (MI); Rachel Smith has half of Branch County (MI) completed; Eric Kerney is about one-third of the way finished with Calhoun County (MI); Brian Musser has completed Steuben County (IN); and Matt has almost completed Van Buren County (MI). Briand and Matt will be working on LaGrange and St. Joseph Counties (IN). This merging of data should be completed by the next meeting on August 23, 2012. Landscape Level Functional data is completed for the entire watershed. The Southwest Michigan Land Conservancy has been contracted to assist with planning events to promote the project starting this summer. Combining with other organizations already planning on hosting workshops this summer will aid in spreading the word about the wetland assessment grant and how it can be used. Our next meeting will be held on Thursday, August 23 at 10:15 a.m. in the Three Rivers Public Library.